A volcano has erupted in Ecuador, blasting huge flows of lava out of its crater and sending ash into the sky. Appealing for help, a local mayor said one person had been killed and another 60 people were believed to be missing. 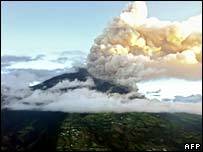 The Tungurahua volcano, located about 130km (80 miles) south of the capital Quito, began erupting on Wednesday and activity intensified overnight. The Ecuadorean authorities, on alert since recent seismic activity, have managed to evacuate hundreds of people. "We have recovered the body of one man," Local mayor Juan Salazar told a local television station. "We have three or four other people trapped in the rubble." Mr Salazar said that the situation was "extremely grave". "This is an indescribable catastrophe. The houses have collapsed. The rocks that fell caused injuries and burns in the city of Riobamba and in Penipe," he said. He said the villages of Bilbao and Penipe had suffered heavy damage and those of Chilibu, Chogloctuz and Palitagua had been "wiped out". Frightened villagers have been fleeing the area, protecting themselves as best they can from falling debris with blankets or buckets covering their heads as they make their way down the mountainside. Thousands of people have crowded into nearby churches and schools, said Javier Bermeo who runs the shelters in Tungurahua province. President Alfredo Palacio is due to visit the area to assess the damage. Volcanologist Alexandra Alvarado told the Associated Press news agency the volcano was emitting "a constant eruption with an abundance of ash and a great number of explosions". But she added the seismic activity was lower than in July, when there was a series of loud explosions. A scientist with the national geophysics institute said the volcano had calmed down in the past few hours but a new cycle could begin at any moment.